The history of black musical traditions in the Caribbean is rich in variety and follows a long and distinguished path paralleling the development of similar vernacular genres in North and South America. By the late 1800s, the biguine, with its origin in the slavery period, became the epitome of black French Antil-lean Creole music. It was highly popular in Saint-Pierre, Martinique, before the town's decimation by the volcanic erup-tion of Mont Pelee in 1902. This most cosmopolitan and vibrant settlement \\ as the heart of French Creole culture in the region and included a Carnival that equalled the Shrovetide festivals of Port-of-Spain, I rinidad (in the south) and New Orleans (in the north). 1 he music of Saint-Pierre lived on despite the catastrophe, and from 1929 became a feature of pre-Second World War Paris nightclubs and recordinv.. studios. The biguine was not exclusive to Martinique, and ryas performed also in the French territories of Guvane and Guadeloupe. Illustrated with record labels, catalogues, photographs, adver-tisements, maps, and other relevant images, this pioneering discogra-phy lists recordings by linguists, anthropologists and folklorists (com-mencing in 1900) alongside commercial endeavours of biguine orchestras,, from the first sides cut by Stellio in 1929 to 1959 - dawn of the changing 1960s. While the recording cvdc begins somewhat later, the discography enables empirical comparison with parallel black Creole jazz recordings from New Orleans, Louisiana, U.S.A., and records representing the string band and calypso traditions of Trinidad. Printed in both French and English, a notable feature is the contextual essay by John Cowley - 'Masearade, biguine and the bal negre' - which traces the roots of the music from its French Antillean inception, via ´the Carnivals of Saint-Pierre, to the opening of the Parisian bal negre in the rue Blomet in 1924 and the burgeoning popularity of the genre fuelled by the Exposi-tion Coloniale de Paris in 1931. Black Caribbean musical traditions are rich in variety and the biguine, originating in slavery, epitomises French Antillean Creole music. Highly popular in Saint-Pierre, Martinique, before the town's 1902 decimation by Mont Pelée's volcanic eruption, the Creole Music lived on and from 1929 became a feature of Paris nightclubs and recording studios. 'Creole Music Of The French West Indies, A Discography, 1900-1959' is illustrated with record labels, catalogues, photographs, advertisements, maps, and other images. Recordings by linguists, anthropologists and folklorists are listed alongside commercial releases. In both French and English, a notable feature is John Cowley's historical essay exploring the Creole Music, Creole carnival and dancing - 'Mascarade, biguine and the bal nègre'. 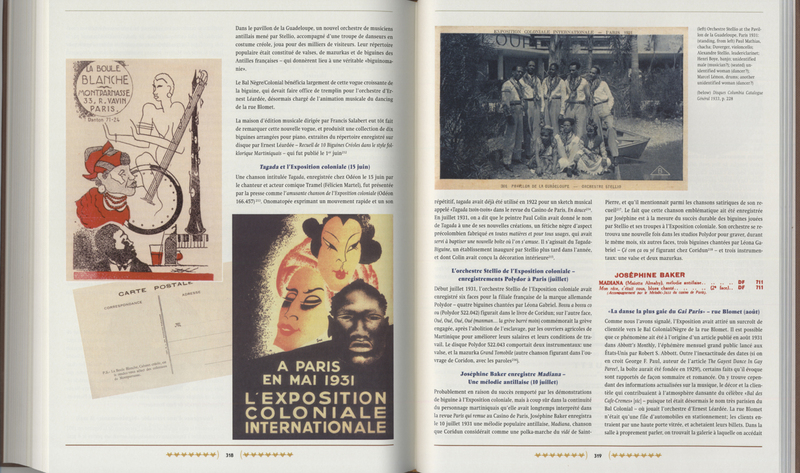 Discography – Music (Biguine) – Folklore – Ethnomusicology – Anthropology – History – Carnival – French West Indies – Martinique, Saint-Pierre – France, Paris – Paris, Harlem Renaissance. "Alain Boulanger, John Cowley & Marc Monneraye"
The history of black musical traditions in the Caribbean is rich in variety and follows a long and distinguished path paralleling the development of similar vernacular genres in North and South America. By the late 1800s, the biguine, with its origin in the slavery period, became the epitome of black French Antillean Creole music. 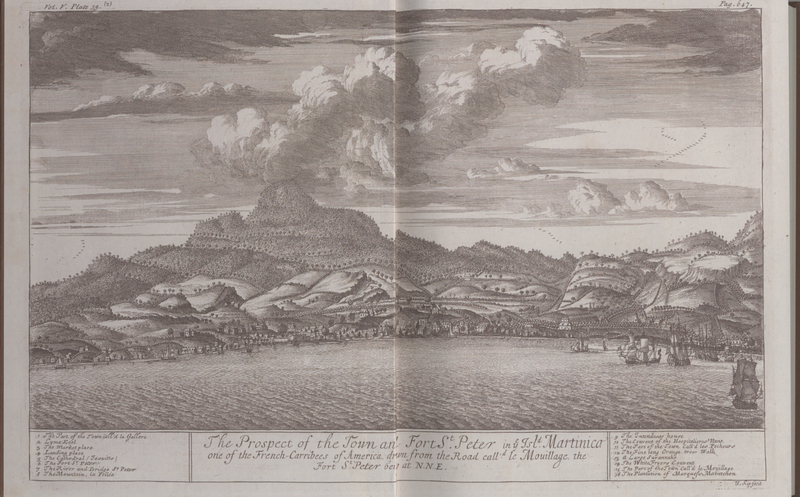 It was highly popular in Saint-Pierre, Martinique, before the town’s decimation by the volcanic eruption of Mont Pelée in 1902. This most cosmopolitan and vibrant settlement was the heart of French Creole culture in the region and included a Carnival that equalled the Shrovetide festivals of Port-of-Spain, Trinidad (in the south) and New Orleans (in the north). The music of Saint-Pierre lived on despite the catastrophe, and from 1929 became a feature of pre-Second World War Paris nightclubs and recording studios. The biguine was not exclusive to Martinique, and was performed also in the French territories of Guyane and Guadeloupe. [ Illustrated with record labels, catalogues, photographs, advertisements, maps, and other relevant images, this pioneering discography lists recordings by linguists, anthropologists and folklorists (commencing in 1900) alongside commercial endeavours of biguine orchestras, from the first sides cut by Stellio in 1929 to 1959 – dawn of the changing 1960s. While the recording cycle begins somewhat later, the discography enables empirical comparison with parallel black Creole jazz recordings from New Orleans, Louisiana, U.S.A., and records representing the string band and calypso traditions of Trinidad. Printed in both French and English, a notable feature is the contextual essay by John Cowley – ‘Mascarade, biguine and the bal nègre’ – which traces the roots of the music from its French Antillean inception, via the Carnivals of Saint-Pierre, to the opening of the Parisian bal nègre in the rue Blomet in 1924 and the burgeoning popularity of the genre fuelled by the Exposition Coloniale de Paris in 1931. 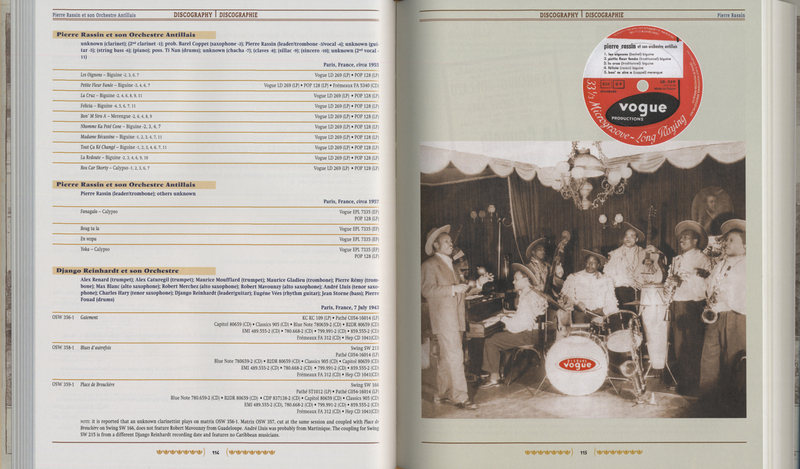 Customer evaluation for "Creole Music Of The French West Indies A Discography 1900-1959"
Jazzwise 10/15	"The book is a visual feast, with each page dotted with record labels, maps, posters, and utterly charming promotional photographs of musicians." Blues & Rhythm 11/15	"Such a meticulously researched work will only become more valuable as time passes. Many of the names involved in the research will be familar to B & R readers, and thanks to Bear Family, which has once again taken presentation of this type of material to new heights." 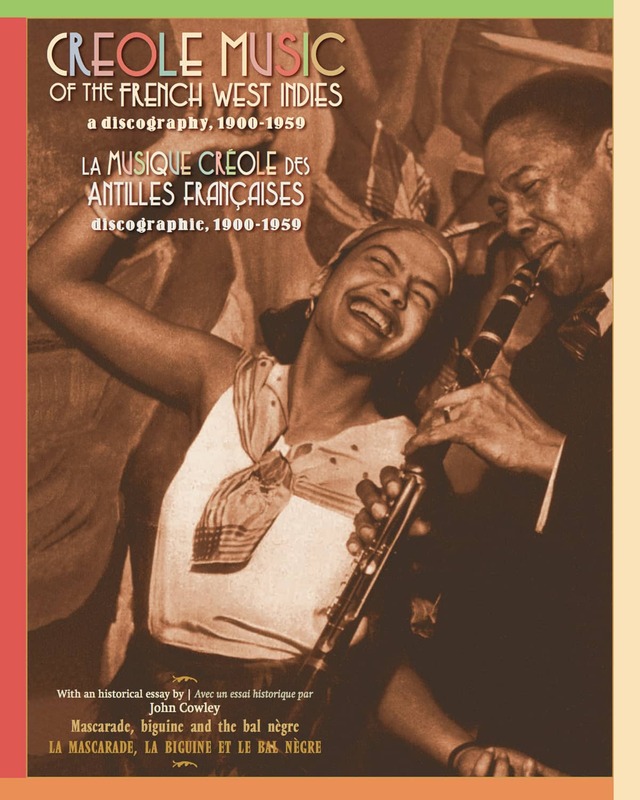 Press - CREOLE MUSIC OF THE FRENCH WEST INDIES —A DISCOGRAPHY 1900-1959 John Cowley (Editor) Bear Family Publications BFB 10028 (2014); 367 pages; illustrated; ISBN 978-3-89916-7054 Things have come a long, long way since discographies were just lists of records with personnel and recording dates where known. This beautiful-looking tome was originally intended as a list of 78s containing French Caribbean music; this includes recordings made in mainland France, England and the U.S.A. within the specified time constraints, and jazz recordings featuring French-Caribbean musicians (from Guadeloupe, Martinique and French Guiana) with either French or American musicians, or their involvement with Latin or African sessions; popular entertainers such as Henri Salvador receive only partial listings, comprising only those titles that are 'idiomatic repertoire of the French Antilles". It became apparent that the end of the 78 rpm era was difficult to define, so 1959 was picked as the most logical end-date. 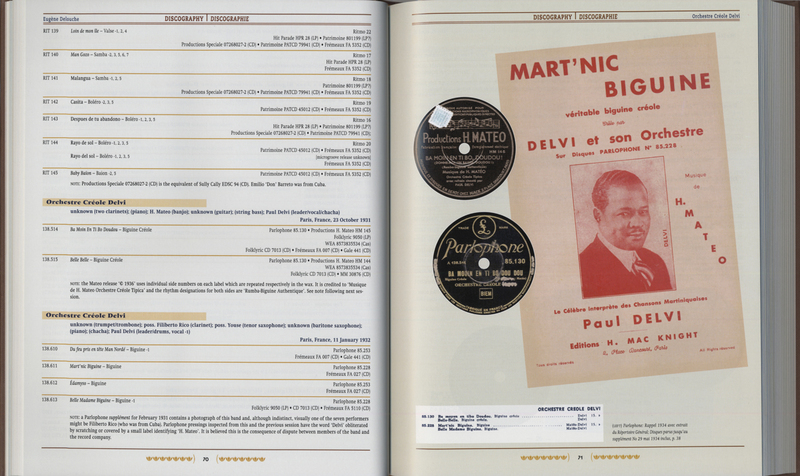 Standard discographical format is followed in the listing itself, which means of course that the first listed session is of four North American spirituals recorded by Louis Achille in 1934! Releases are given for 78s, microgroove and CD issues, there is a checklist for vinyl and CD releases, a list of names, and a title index, in addition to the main discography itself. That may be the prime purpose of the book, but it is actually less than half of the story.